Chefs plan and direct food preparation and cooking activities and prepare and cook meals and specialty foods. This group includes various types of chefs who plan and direct food preparation and cooking activities, and who prepare and cook meals and specialty foods. The terms chef and cook are often used interchangeably, but generally reflect different types of chefs and the organizational structure of the kitchen staff. Also, chefs tend to have more training than cooks. Workers are employed by restaurants, hotels, catering companies, ships, clubs, resorts, lodges and similar establishments, and work in kitchens. Many large restaurants and institutional kitchens have modern equipment, convenient work areas and air conditioning. Older, smaller eating establishments may have less comfortable work settings. Kitchens must be well-ventilated, appropriately lit and properly equipped with sprinkler systems to protect against fires. 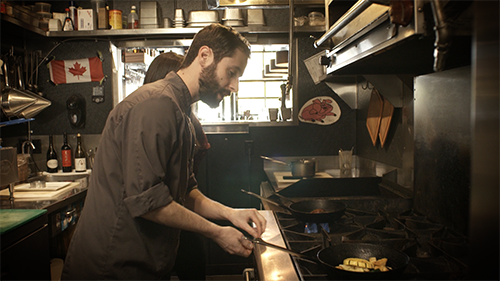 Chefs must work in close quarters during busy time periods, lift heavy objects, work near hot ovens and grills, and stand for extended periods of time. Chefs are under constant time pressure, while ensuring quality, safety and sanitation guidelines are followed. Job hazards include slipping and falling, cuts and minor burns. Work hours vary depending on the establishment, and may include early mornings, late evenings, holidays and weekends. Resorts usually offer seasonal employment only. management training and several years of experience in commercial food preparation, including two years in a supervisory capacity and experience as a sous-chef, specialist chef or chef. Interprovincial Standards Red Seal certification for cooks is available to qualified chefs. For more detailed information, contact the provincial regulator. The average age of those working as chefs in B.C. is younger than the provincial average, so there will be a limited number of chef positions available to replace existing workers who retire. Executive chefs will see an above average number of job openings from retirements. They are responsible for managing large restaurants and catering operations and have experience in human resource management, inventory and cost control, and menu design. There is some mobility among the various types of chefs in this occupational group. As an example, with training and experience, sous-chefs may advance to executive chef positions and executive chefs may progress to managerial positions in food preparation establishments.